Touch all the the flavor bases in your chosen drink with glass baseballs chilled to the ideal temperature. 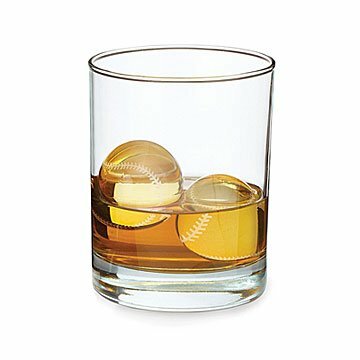 Baseball fans will love pitching winning drinks with these miniature glass baseball chillers that bring spirits to the ideal temperature without diluting them. Put the chillers in a freezer for four hours, then use instead of ice in your drink. Glass won't absorb unwanted tastes or flavors, and may be used again and again. The set is packaged in a handcrafted wooden box, and makes a thoughtful gift for someone who always wears their mitt to games, in hopes of catching a home run. Chillers made in China. Wooden box handmade in Minneapolis, Minnesota by Darrell Kramin and his team. Please see details tab for measurements. Each set includes two 1.5" in diameter chillers. He loved the gift- and said that the chillers stayed cold for quite some time.